QUEBEC – A subsidiary of Montreal-based Champion Iron Limited, Quebec Iron Ore Inc., has signed an impact and benefits agreement with the Innu of Takuaikan Uashat mak Mani-utenam (ITUM) regarding the Bloom Lake iron ore mine 400 km north of Sept-Iles. Bloom Lake rock type block model for the pit area. Champion says the signing of the IBA signals the consent of the local community for the mine to be reopened. The IBA will remain in effect for the life of the Bloom Lake mine. It provides for training, jobs and contract opportunities for the ITUM. It also specifies fair and equitable financial and socio-economic benefits. The IBA contains provisions which recognize and support the culture, traditions and values of the Innu, including recognition of their bond with the natural environment. 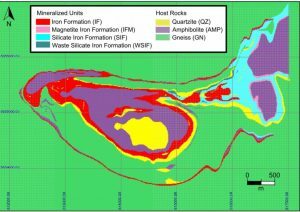 The Bloom Lake property is located on the south end of the Labrador Trough, 13 km north of Fermont, Que., and 10 km north of the suspended Mount Wright iron ore project. The feasibility study for Bloom Lake was updated earlier this year. More information is posted at www.ChampionIron.com.